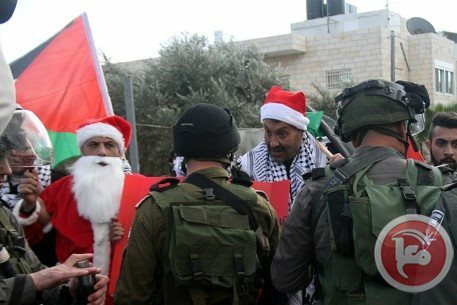 BETHLEHEM (Ma’an) — Israeli forces on Tuesday suppressed a peaceful march calling for “Christmas without occupation” in Bethlehem. The ancient Palestinian city — said to be the birthplace of Jesus Christ — is now surrounded by illegal Israeli settlements on all sides. Bethlehem is also cut off from Jerusalem, historically its twin city, by Israel’s separation wall, which runs along the northern side of the city.